What is 'say it once'? 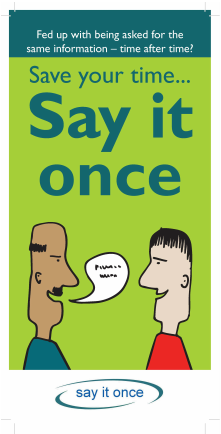 Say It Once is run by a group of voluntary sector organisations in Hampshire, Portsmouth and Southampton. They are working together to help service users, patients and carers record their own health and social care information, in whatever format they choose, so they can share it with relatives, friends and professionals who support them. How many times have you been asked for the same information by different health and social care professionals? Different health and social care professionals often ask you for the same information over and over again. This wastes time - yours and theirs. We have developed easy-to-use forms to help you record and share your information. · create a personal record of your own information for you to keep. This could be; medications you take, contact details for friends and family, people who rely on you for care and support and/or your personal wishes and beliefs. · Include as much or as little information as you wish. · Share your information easily with the professionals working with you. Download the forms and use them on your own computer - or print them out to give to professionals you are working with. No personal information is stored on the Say it Once website.